The reviews are in, and GrandStay Traverse City is definitely one of the “places to stay” for visitors to the area. The property has been awarded TripAdvisor’s 2018 Certificate of Excellence, an award it’s received eight years in a row. This is not surprising. This beautiful, newly renovated hotel offers a wide range of amenities for visitors, from standard, two-queen guest rooms to whirlpool king and two-room suites. 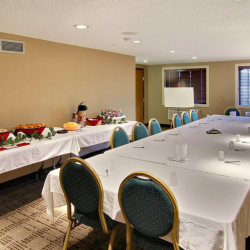 Add to this a large, heated, indoor pool and a complimentary Grand Start® Breakfast, with a great assortment of hot and cold buffet items, and you have plenty of reasons to like it here. Perhaps one of the most notable features of the hotel, however, is its personal service and attentiveness to its guests. (The chocolate chip cookies at the front desk are a guest favorite! 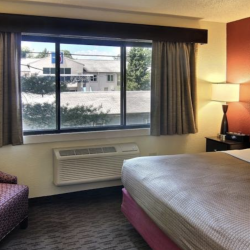 In addition to providing clean, comfortable rooms, the GrandStay Hotel & suites is convenient to the many activities and attractions the area has to offer. 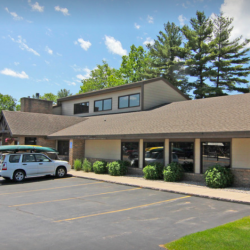 Located right on US-31N, the hotel is walking distance to Pirate’s Cove, a popular family attraction offering a—you guessed it—pirate-themed golf adventure. Family restaurants are located within a block or two, and many more are just a minute drive in either direction. The hotel also backs up to the TART Trail, a scenic biking trail that extends over 20 miles north, up to Suttons Bay. Championship golf courses, celebrated wineries, brewpubs and distilleries, downtown shops, and galleries, and more are all within easy driving distance. Simply make your choice and let your spirit of adventure be your guide.